If you’re like us – the number of how many flights your baby has been on and how many months old they are – are the same number. We’ve actually enjoyed flying across the country (to and from Florida to Texas, and Georgia, and Colorado, and California) with our little man, and you can too. Naturally, us as moms tend to have anxiety about things that COULD happen. What if baby screams on the plane? What if our luggage is lost? What if, what if, what if… Here’s what you won’t see on any other know-it-all mommy blog: you can’t control that “what could happen.” You can, with your parenting super powers, control how you prepare and react to your traveling – setting a foundation for success and relaxation! Here are some tips that have worked with us in traveling with baby; they categorized by general infants and age/ activeness! General: 0 mo. – 12 mo. Nurse, bottle or pacifier during take off or landing – this sucking motion helps relieve their ears from pressure changes. If you can feel it, so can they. 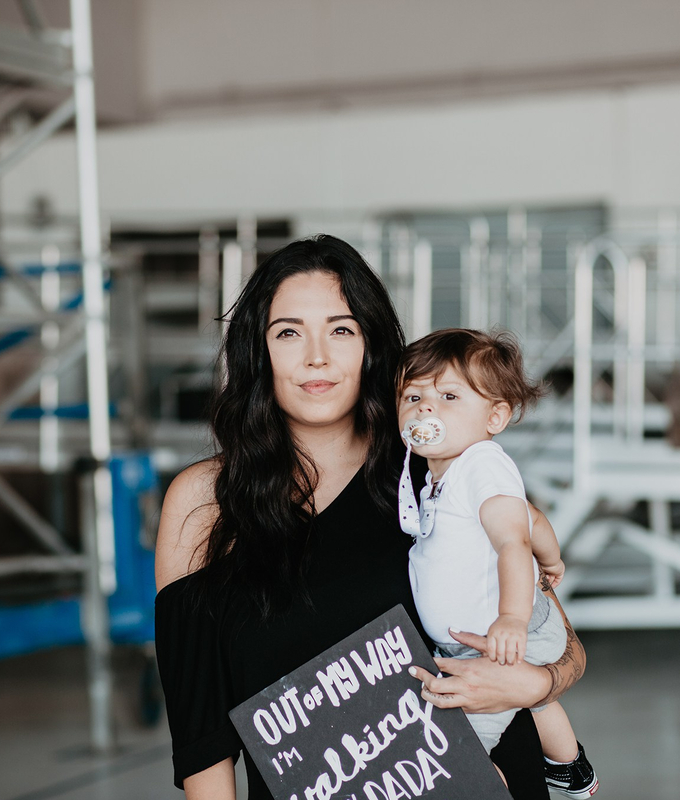 Baby wear thru airport – from the moment we get out of our uber to the moment we arrive at our gate, babe will be in an Ergo, Moby, or Boppy wrap/ carrier. It’s best to be hands free during checking-in, security, and grabbing coffee! Dock a tot and pack n play – easy and familiar sleep spaces can make time zone change adjustments be smoother. Buy diapers and wipes when you arrive to your destination to save luggage space. Or if you’re visiting family, use Amazon prime to send them before your trip! Zip – up jammies – These will keep babe warm, and if there’s a blow out, you’re not changing multiple layers! Window seat if nursing – Privacy from rude stares! Check car seat and stroller at gate – This guarantees they will arrive to your destination and they will be ready to go as soon as your step off the plane… to carry your carry-ons! Simple separates – Helpful with babies who need quick changes and to regulate their temperature. A simple tee and pants will be great! Aisle seat – access to walk your busy bee or use restrooms for changing table. Snacks + drink service cup – free and least annoying toys to entertain your explorer. Check car seat and stroller with luggage – your little one may prefer seeing the airport from the ground or in your arms. By now, packing will be lighter! And no matter how old, active, near or far – react to your baby’s needs, NOT to other people. If you are focused on what a blessing your baby is, the ability to travel is, and pray over your trip – there will be no room for fear or anxiety to worry about others. We were blessed with great neighbors on our flights, many even complimented us afterwards on how well they went… but our focus was on keeping our son comfortable as possible. I hope you found this post helpful! Please leave any tips or tricks you have for other parents below in the comments; I’d love to hear from you! 2 months vs. 10 months – Still snoozin!